Now on wax!!! 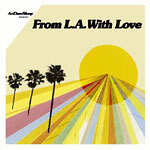 An amazingly eclectic collection of music from LA talent. Staggering pop, spaced out bossanova, glitchy beats and sun-drenched soul from the likes of Nobody, DJ Dusk (RIP), Adventure Time, Exile, Georgia Anne Muldrow, Flying Lotus, Yesterday's New Quintet, and even our very good friend Gaslamp Killer! This is the future of music right here, grab hold!